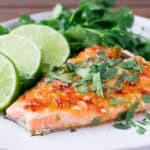 This Sweet Chili Salmon recipe, with only 4 ingredients, makes dinner quick, easy, and simply delicious! Whenever I make my infamous coconut shrimp recipe, we dip them in sweet chili sauce. I figured if this sauce pairs so well with shrimp, then it would probably be really delicious on other types of seafood as well! Salmon is my usual go-to when I’m in the mood for fish. It’s pretty versatile, so there’s a lot you can do with it and it will still taste amazing. Plus, it’s so super healthy for you! I have to say, basting salmon in a slightly modified sweet chili sauce turned out to be a great idea! In addition to being really flavorful, the time and effort that you need to make it is minimal! It’s basically ready to eat in about 15 minutes! What could be more perfect for a busy weeknight?! 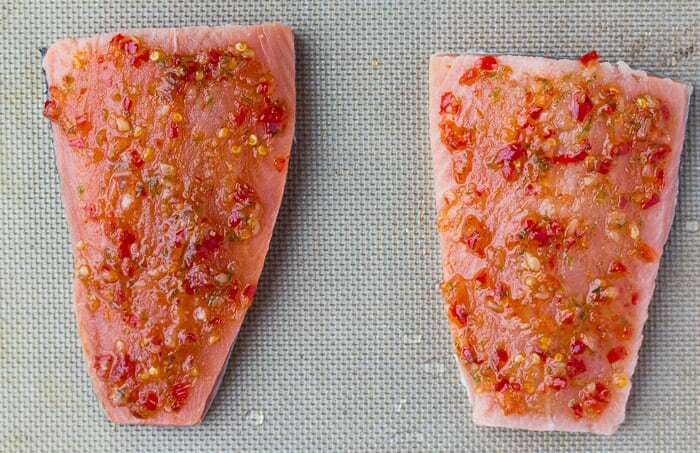 This recipe uses a bottled sweet chili sauce (I use this one) so you will only need 4 ingredients on hand to make this Sweet Chili Salmon! 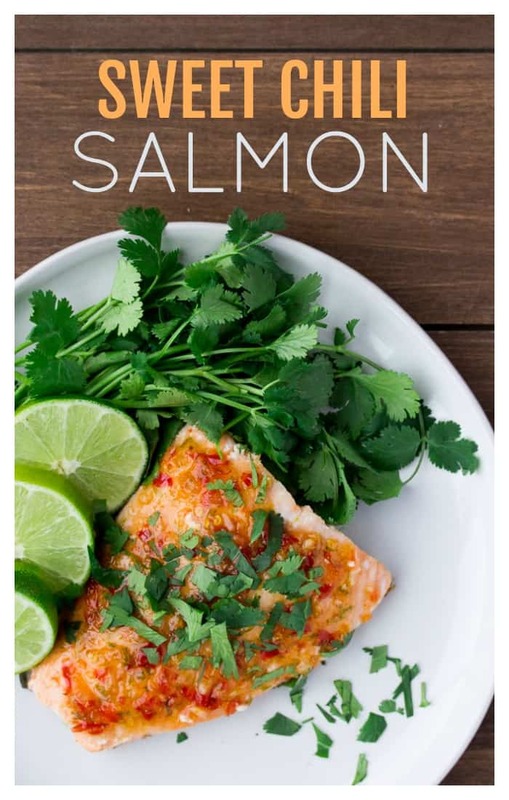 Rinse off your salmon fillets and place them on a sheet pan, skin side down. Zest and juice the lime, and roughly chop the cilantro. 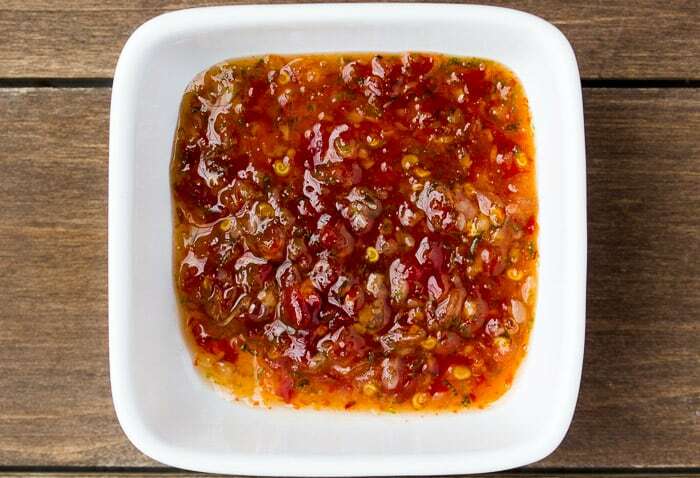 In a small bowl, mix together the sweet chili sauce, about 1/2 teaspoon of the lime juice, and the lime zest. Brush evenly onto the salmon fillets. Bake for about 10 minutes, until the salmon meat flakes away easily with a fork. 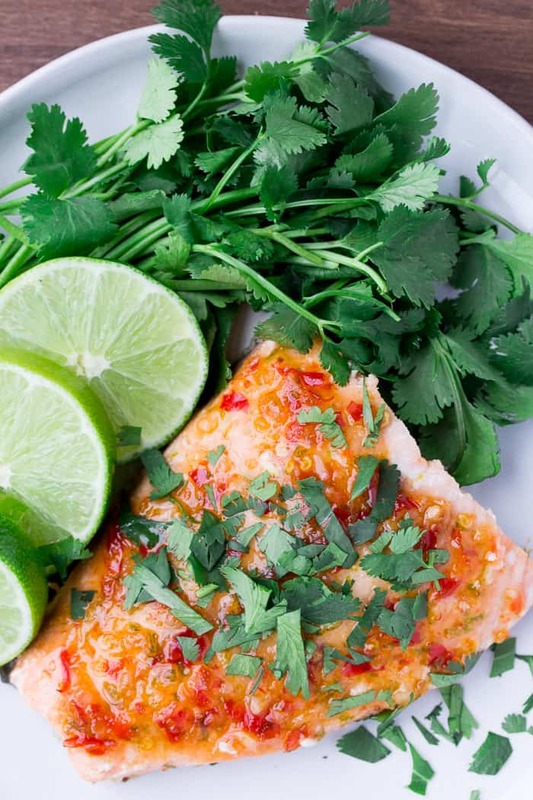 Top the salmon with the chopped cilantro. 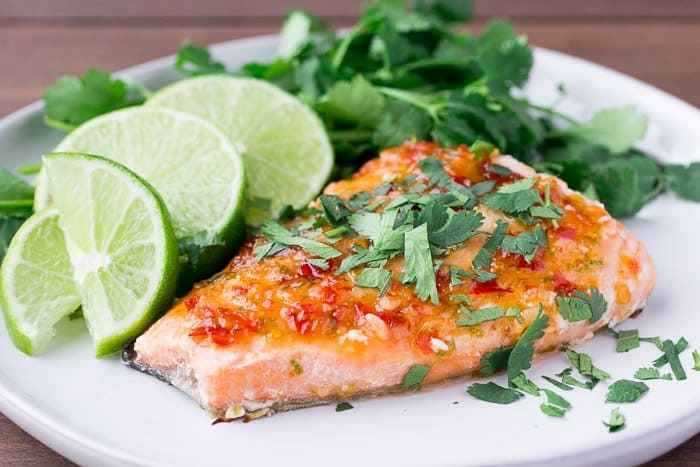 This Sweet Chili Salmon recipe goes great with rice (try my easy Coconut Rice recipe!) and vegetables! PREP: Rinse off your salmon fillets and place them on a sheet pan, skin side down. Zest and juice the lime, and roughly chop the cilantro. Preheat your oven to 400°F. In a small bowl, mix together the sweet chili sauce, about 1/2 teaspoon of the lime juice, and the lime zest. Brush evenly onto the salmon fillets. What a tasty looking dish and that sauce! Ohemgee, looks amazing! Pinning! LOVE the sweet chili flavor on everything. My husband LOVEs this! Me too, me too! It’s so good!! I needed this sauce last night for shrimp. I love chili sauces on seaford. This is such a pretty dish and the sauce looks amazing! I love sweet chili sauce. This is a great dinner for busy nights that’s full of flavor.